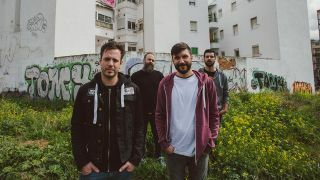 Spanish instrumental prog rockers Toundra premiere a brand new documentary with Prog. The short film, which you can watch below, was filmed at a secret gig the band performed at the German club that gave the band the title for most recent album Vortex. "Going to Vortex is like coming home; even since the first day, it has always been a very special place for us," the band tell Prog. "When we announced the name of the album they immediately got in touch to organise that release party, which turned out to become one of the most special shows we have ever done, one that we keep very fond feelings of because of all the friends we shared it with. The video is a nice glimpse testimony of that. And a good placeholder for the time until we wait to get there again." Toundra released Vortex earlier this year and the video for the track Cobra, which highlighted the plight of the world's refugee crisis, was nominated for a Prog Award this year.